Grosvenor, a privately owned property group has announced that they have plans to develop the site located at 801-819 Pacific Street in Vancouver. The proposed plan for this adjacent site includes a seven-storey City-owned arts and culture building as part of the community amenity contribution for the rezoning of 1380-1382 Hornby Street. The plan also includes continuation of the new Pacific Street dedicated bike lane, expanded sidewalks and additional street trees to improve the public realm. You can find more details on the application here. Located at the corner of Hornby and Pacific the development will consist of approximately 212 homes including 1,2 and 3 bedroom condos along with 3 two storey town-homes. This prime Yaletown location will feature spectacular views of False Creek and the city. Within walking distance of seawall, Aquabus, and Yaletown restaurants. You can register for more information at the Grosvenor website HERE. 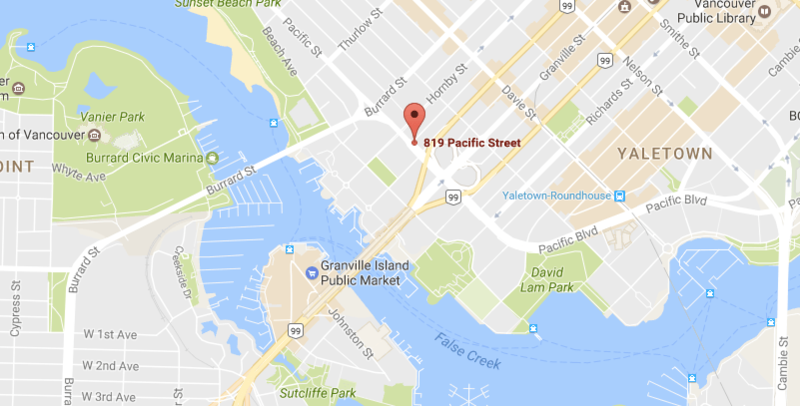 Location of Grosvenor Pacific, 819 Pacific Street, Vancouver.